2016.12.31 - I celebrated a decade of doing space archaeology this year. I have items to add at the end of the decade. 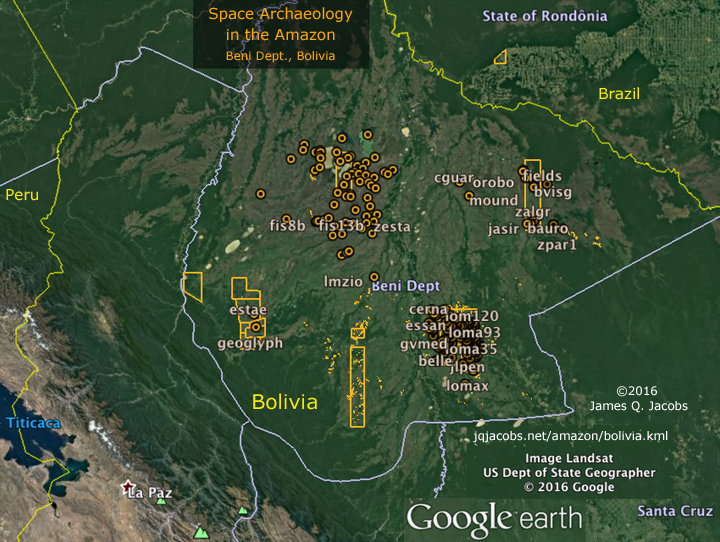 After catching up the Amazon Geoglyphs survey, I turned to the adjacent area to the south in Bolivia. 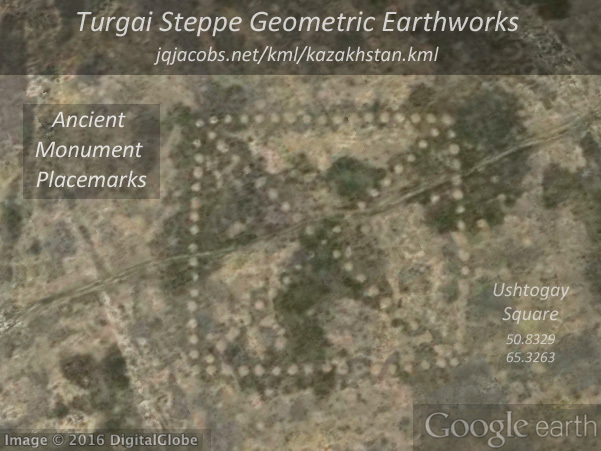 Several areas with newly updated hi-res imagery in Google Earth had dense prehistoric occupation with earth moving cultural expressions. This Amazonian region, a vast, seasonally flooded savannah known as Llanos de Mojos, is particularly rich in archaeology. Elaborate causeway and canal networks and extensive raised agricultural fields are visible along with geometric earthworks and mounds. Survey results are placemarked in a new Google Earth KML file. Neolithic monuments of Denmark also captured my attention this year, especially the monument concentration near the phi latitude. The burial mounds in Denmark led to other parts of Europe with large tumuli too. And the Danish stone ships led to more research in Scandanavia. 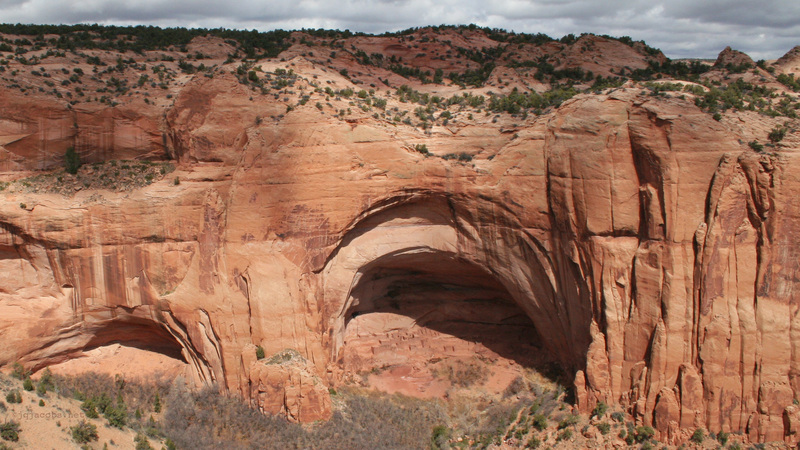 I utilize the Panoramio photo layer in Google Earth, a valuable visual research tool. Regretfully, Panoramio, the pioneer in geolocated photos, is closing. Google is transistioning to hosting the images from the Google+ site. During the past decade, I've embedded about 4,000+ Panoramio photos in placemark files, images I selected from the multitude available for the best visuals of the archaeology. I'm uncertain if or for how long the placemark embedded photos will remain visible. Hopefully this aspect of my work during the last decade will not be lost. Just in case, see them while you can: Ancient Monument Placemarks. For personal research use, I downloaded all 4,000+ Panoramio images, a fun chore but a time consuming task too. 2016.04.16 - Newark Earthworks is monumental, an outlier in scale of constuction. Archaeogeodesy research results confirm its prominence. Pinson Mounds in western Tennessee, the largest Middle Woodland mound complex in the Southeast, includes the second-highest mound in the United States. At 160 acres in extent, Pinson is larger than the Ohio earthworks complexes with the exception of Newark. In scale, Pinson Circle is equal to Newark's slightly elliptical (1,163 by 1,189 feet) Great Circle. Today Pinson Circle has a surviving 141° arc section of a near perfect circle 1,190 feet in diameter. Pinson excavations evidenced inter-site exchange with flint bladelets from Flint Ridge, Ohio, very near Newark. Pinson has even been called a Hopewell site. 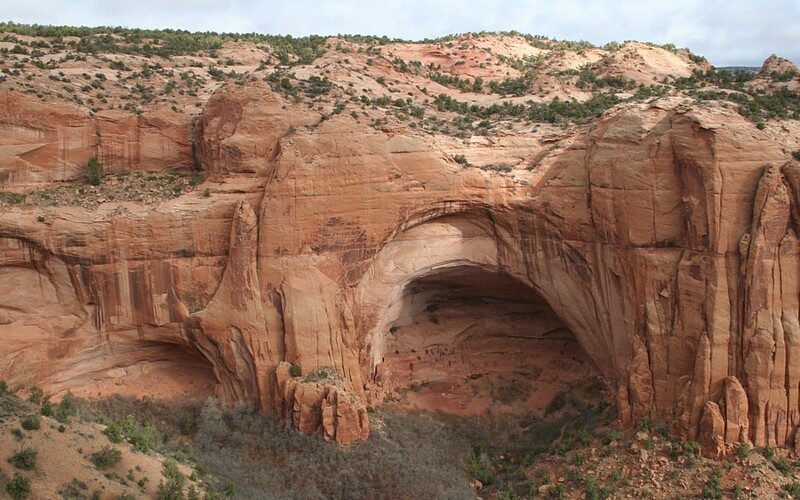 I examined the inter-site spatial relationships of the monumental features at the two sites. The results support the interpretation of a lunar major alignment for Newark Octagon. The arc distance from the Octagon's Observatory Mound	to	Pinson Circle's centerpoint equals	6.7006°	or 0.0186127 earth circumference. During the Hopewell era, years per lunar standstill equaled 18.6127. From Eagle Mound at the center of Newark's Great Circle to	Pinson Circle, the arc	distance equals 6.70514°	(0.250000 s22). From Newark, the direction to Pinson and lunar major set coincide closely enough to merit dating the epoch of precision. See the major Pinson monuments and the arcs with the companion Google Earth placemarks: http://jqjacobs.net/kml/pinson.kml. Mainfort, Robert C., Jr. 2013 Pinson Mounds: Middle Woodland Ceremonialism in the Midsouth. The University of Arkansas Press. McNutt, Charles H. 2005 The Pinson Observatory, Southeastern Archaeology 24(2):142-62. 2016.02.16 - After a hiatus and a power outage erasing an earlier edit, time for catching up. I need to build permalink pages too, but first what's new. Banpocun Pyramids. Two large tombs near Xian, China, many smaller tombs nearby. Pinson Mounds State Archaeological Park major monuments and research results. Poverty Point Earthworks includes an archaeogeodesy research results folder.